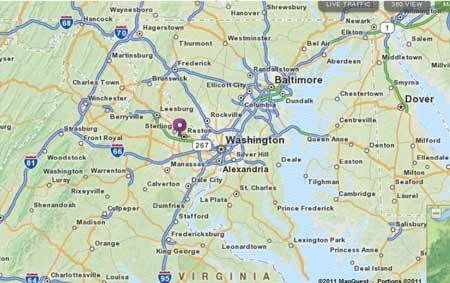 Herndon VA, home to the Herndon Depot Museum and the location for "Mosby's Raid on Herndon Station", a skirmish from the Civil War that occurred in 1863, is also known for being the headquarter's location for companies like Verizon and AOL. 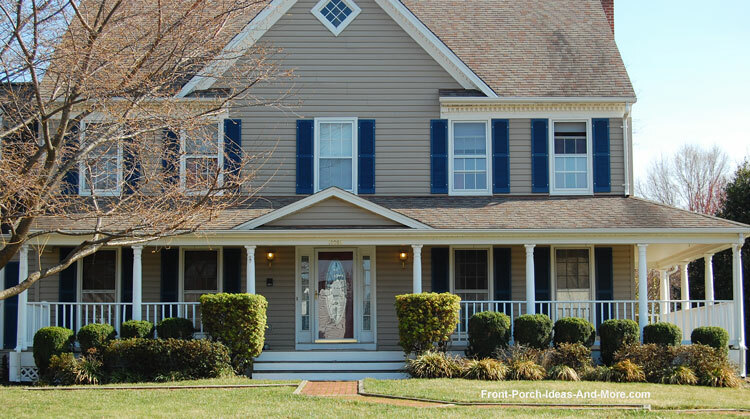 Technology and history aside, Herndon Virginia is also home to some wonderful front porch designs. Mary and I had lots of fun exploring the back streets and neighborhoods of what appears to be a very modern city. 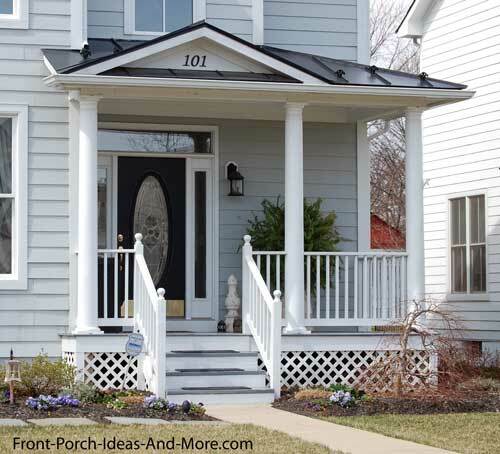 We found porches with really impressive front porch design ideas too! 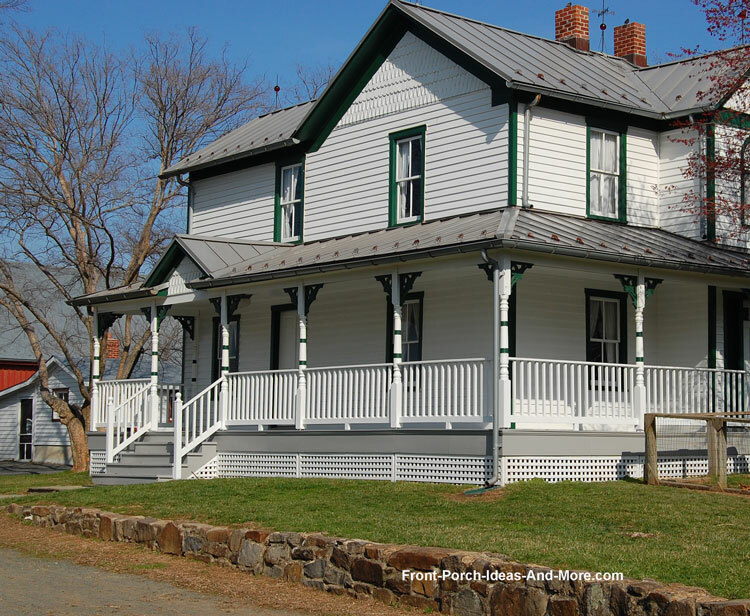 Interestingly, we found this country porch in the heart of Herndon VA! Note the small gable roof over the steps. It adds just enough contrast to break up the large porch roof and mimics the gables on the house roof. 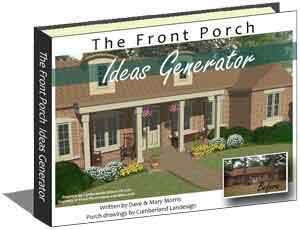 This idea works on smaller porch roofs too. 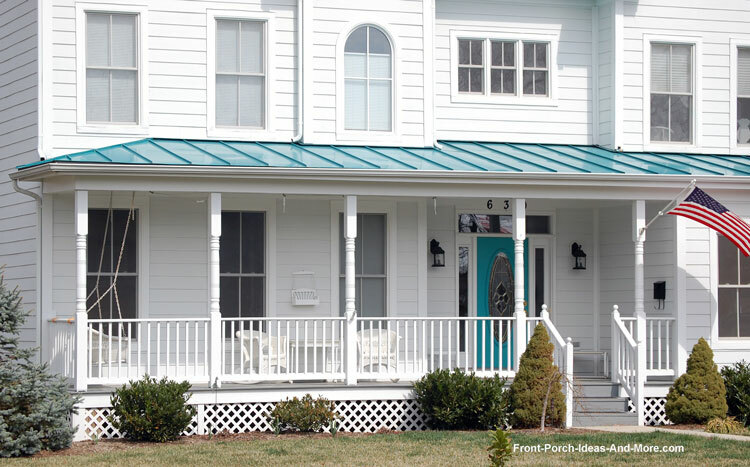 Not to be outdone, we also found the same porch roof design on this more contemporary country porch. 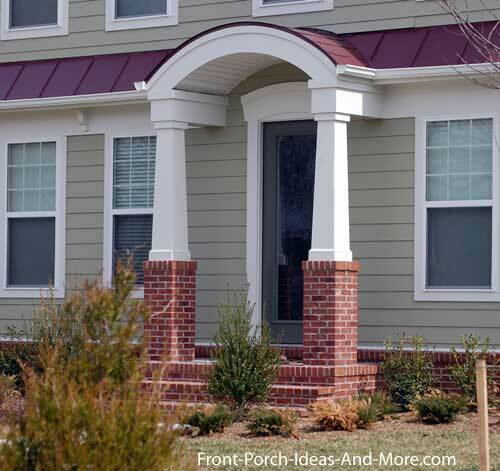 There's nothing quite like the look of a large wrap-around porch. 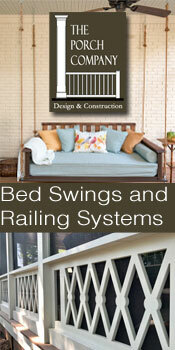 It is a pleasing feature and can be found across the U.S. in the country, suburbs, or in the heart of a city. This small porch is impressive. 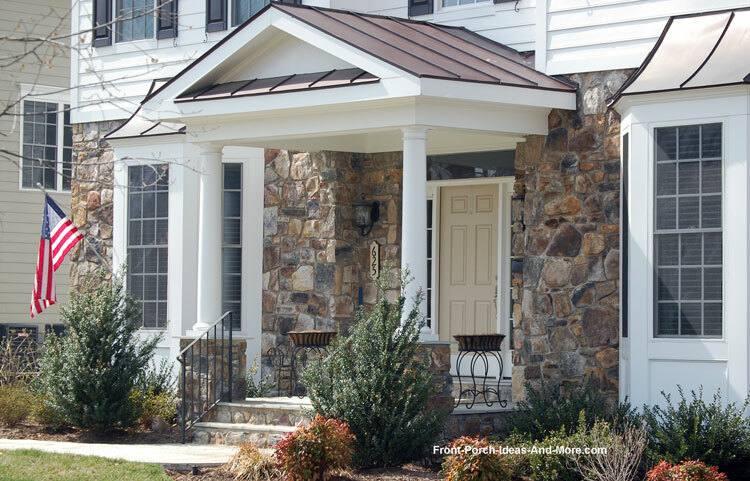 The unique gable roof design over this porch makes a statement and we really like the color of the roof itself. 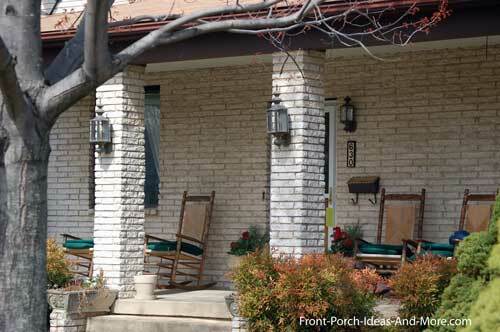 The stone pedestals match the stone on the home and aesthetically ties the porch and home together. 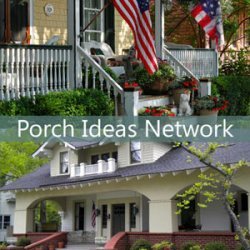 You can use this idea with almost any porch design. We really like the brick columns (which you don't see very often) and the lantern sconces on the columns and beside the front door. The sconces visually break the pattern of the columns to soften the overall look. Brick tends to be imposing so adding artwork, sconces, or other amenities keeps it from being overwhelming. 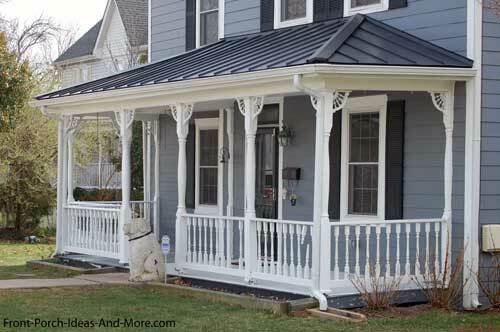 Definitely, one of my favorite porch roof designs. 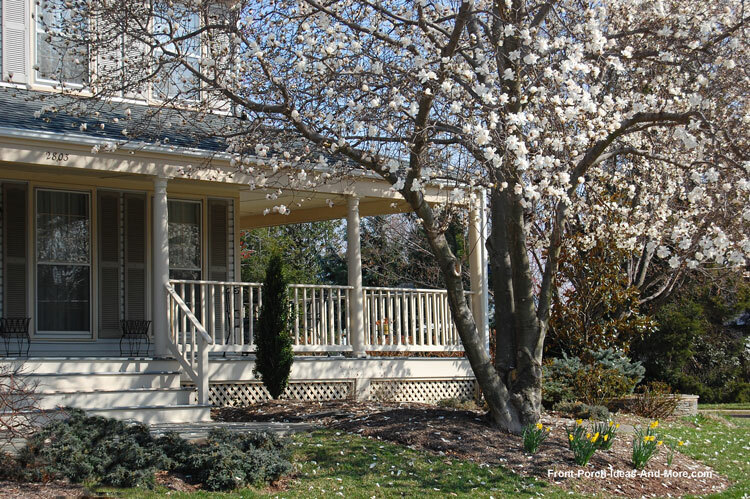 Combined with craftsman-style columns and pedestals, this small porch is charming. All I would add is possibly a complementary piece of artwork beside the door. Notice how the arch in the roof is matched by the arch over the front door. Nice touch. Another gable over the steps on a shed-type roof - another great example of the appeal this has on a home. It need not be a large gable to be effective. And you can easily see the affect it can have even on a relatively small porch. Just wanted to show you how they replicated the color of the roof with that of the front door. Haven't seen this very often but it has a pleasing effect. 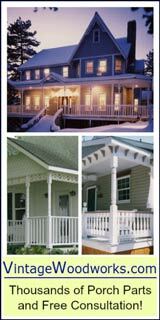 Wanted to show you how a little exterior house trim, that is, brackets, can add appeal to almost any porch. 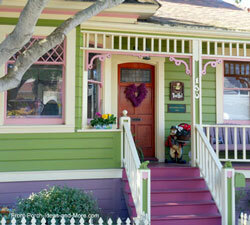 I think it adds lots of charm to this unassuming porch. Notice the hip roof design also. 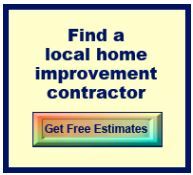 I recommend this whenever feasible as it adds another dimension to your porch and home. 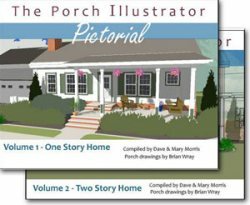 We know almost any town in America has great porches so we weren't surprised that we found some very good front porch designs to share with you in Herndon VA. We are; however, surprised at how many we found so you'll find other Herndon porches displayed throughout our site. 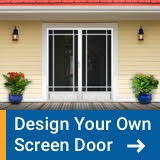 As always, we enjoyed our stay in Herndon VA and hope you enjoyed our front porch ideas.